Let the lady go first: Even today’s worldly gents tend to forget the simple art of escorting. 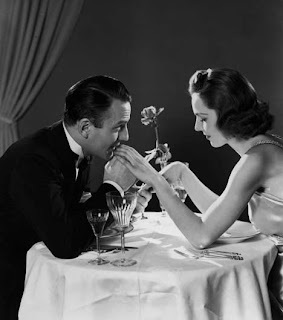 It may seem old fashioned, but I believe the simple gestures of opening a door, extending a guiding arm, and ushering your lady from her residence to your table really goes a long way towards making her feel special and classing up the evening. Remember to always let her sit on the inside of the table facing the rest of the restaurant and wait until she is seated to sit down yourself; the idea is that while she may be staring off into the distance, at least you’ll be focused directly on her. Lastly, and this rule goes for whether there are two or ten people at the table, wait until all of the food is served before you start chowing down. Take control of the ordering situation: There’s nothing worse than indecision delaying delivery of the first round of aperitifs; so while you definitely need to ask for her wine/apps preference, you also need to take on the ordering duty…make it easy on her and get those cocktails served asap. Speaking of cocktails…don’t be a hero and down a bottle of wine before the main course. Everyone needs a little social lubrication but there’s nothing that kills a night quicker than slurring your speech. Encourage a happy medium for the both of you and keep the waters flowing. Be attentive and dashing: One simple rule you may want to follow is to listen twice as much as you talk. Even if she may be quite the Chatty Kathy, at least it gives you a chance to enjoy your beverage while she blabbers on. A couple other tried and true techniques: maintain good posture (i.e. no elbows on the table, Bub), always excuse yourself before sneaking away, and NEVER whip out that cell phone…maybe I’m old fashioned (or maybe I just grew up when we still had collect calling) but there is nothing worse than watching two people checking Facebook at a restaurant…I’m fairly certain the video of that brat Charlie biting people will still be there when you get home. And finally, for God’s sake pick up the tab…no matter how much cash she may be throwing at you, while protesting like a hippie in Zuccotti Park, don’t even think about splitting the costs. It may be an antiquated, sexist gesture but regardless it shows you care enough about her to forgo the fancy beer on football Sunday and stick with the Triple Hops Brewed cheapness of Miller Lite…and with that thought we’ll segue into the next episode…thanks for reading.